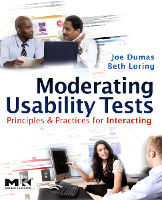 Welcome to the website for Dumas, Loring: Moderating Usability Tests: Principles and Practices for Interacting. This companion site features a number of short role-playing videos that accompany Moderating Usability Tests.The videos were filmed in the Bentley College Design and Usability Center laboratory, and were carefully scripted to illustrate the points made in the book. Some of the clips show both good and not-so-good moderating practices. Chapter 11 provides a key to the videos and suggests how to get the most value from them. In addition to the role-playing videos, the authors filmed a discussion by a panel of usability experts. The experts give their opinions about what they see in the videos and discuss the trade-offs that you might consider in each situation.